Not sure whether or not to lease to an applicant? Tenant Score and Tenant Score PLUS, available only through MyRental.com by CoreLogic®, can help you decide. These unique tools are based on complex algorithms that help assess the potential risk of an applicant compared to others. 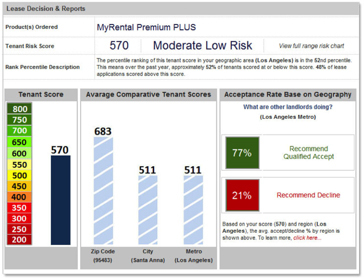 Tenant Score delivers a single score that indicates the riskiness of each applicant. Tenant Score PLUS provides valuable insight into the state of your rental market. Click here to download our informative eBook titled Decision Science: Grow Revenue with Better Applicant Lease Screening. Receive occasional product updates and leasing tips from MyRental.com. The contents of this web site are protected by the copyright laws of the United States. No portion may be reproduced in any form, or by any means, without the prior written consent of CoreLogic, Inc.